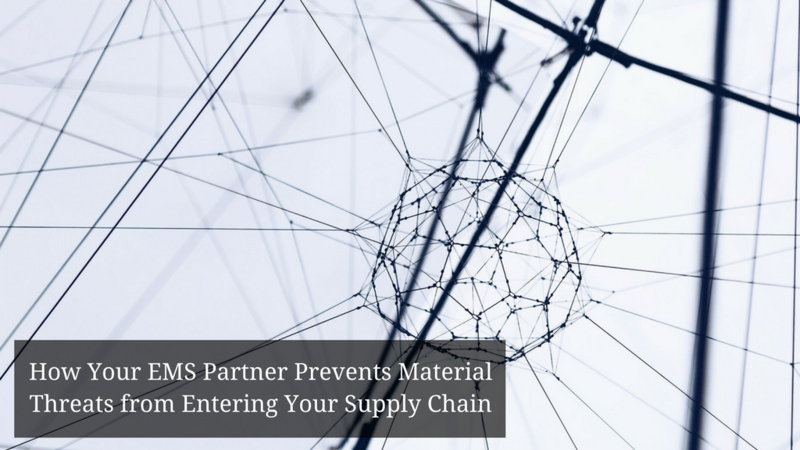 How Your EMS Partner Prevents Material Threats from Entering Your Supply Chain - Allazo Electronics, Inc.
A healthy supply chain is vital to the success of your business. As a result, original equipment manufacturers (OEMs) are turning over supply chain management to electronic manufacturing services (EMS) providers. With the shift in responsibility, OEMs can concentrate on developing the core competencies of their business. Finding the right EMS partner to outsource to is crucial. By being discerning about who you partner with, you can enhance your business’ reputation and prevent material threats from infiltrating your supply chain. Components received from current suppliers or existing parts from new suppliers should be subject to inspections and verifications. Your EMS provider will compare the dimensions, material type, and surface finishes of the material with the original drawings to ensure consistent product quality. Sometimes, spurious parts can enter the supply chain through the gray market. In fact, bogus parts might appear genuine and even pass basic tests. A good EMS provider will verify the authenticity of the components through electrical testing and by using equipment like high-magnification microscopes and x-ray machines. Active monitoring of the component market is a necessity if you want your business to avoid obsolescence. As a result, your EMS partner should inform you immediately if a device manufacturer decides to withdraw one of the parts of your assembly line from circulation. On top of that, an EMS provider ensures that production continues without a hitch: they obtain samples of alternative devices so that your parts continue to function properly. EMS partners often pay close attention to the financial health of their raw materials suppliers. They take note of changes in ownership and keep a close eye on performance reviews to check whether suppliers meet the service and quality requirements. That way, they can reduce further risks from entering the supply chain. Successfully outsourcing to an EMS provider depends on their ability to prevent material threats and keep your operations running smoothly. At Allazo Electronics, we take pride in our supply chain optimization and customer loyalty. Contact us today for a turnkey solution to your electronic manufacturing needs.